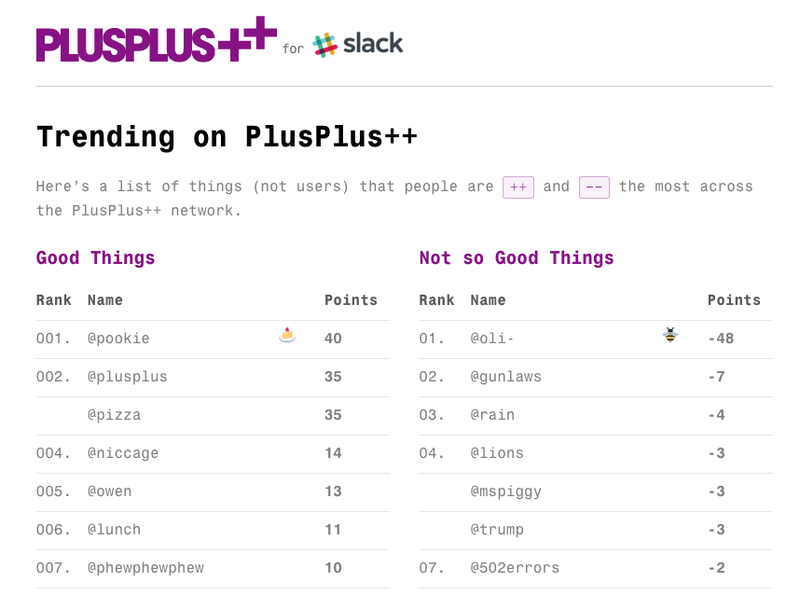 PlusPlus++ is a bot that allows you to keep score of all the good things and not so good things you and your friends say and do. PlusPlus++ launched this week on Slack but we are making plans for further integrations in the future. The way PlusPlus++ works is very simple. Josh shares a gif from Giphy. Allison is amused by this and thinks Josh deserves a reward so she writes ‘@josh++’ in Slack. A point is then added to Josh’s PlusPlus++ score. If later on Josh decides to drown out the office with some loud Skrillex, someone else might write ‘@Josh- -’ and a point will be taken away from Josh’s score. Anyone can check the team leaderboard by typing @plusplus leaderboard. In a way, your PlusPlus++ score becomes a measure of your office karma. There are two leaderboards. One for your local team and a global leaderboard which shows what’s trending across the PlusPlus++ network. Things can be assigned points as well as people: @Pizza or @RepublicanDebate for example. Go Pookie! Oli, you screwed up somewhere. PlusPlus++ was an idea that came from the team playing around with Karmabots — giving people Karma points and keeping score — in Gchat, PartyChat and earlier chat clients. In fact Karmabots at betaworks have a rich history in our office culture. When Karmabot was made for the betaworks Slack team, it quickly became the most popular bot so the team spent some time making it available on other public slack channels such as one of the iOS developers channel — where it also proved very popular. Using the new Add to Slack API a basic public version was built in about four weeks. If the public version is as successful as the private version, more features will be added. Installing the PlusPlus bot is simple. You click add to Slack, select which Slack team you want it to go into and if you like, what slack channel you want your welcome message to be sent. Give it a try. It’s definitely a little bit of a slow burn. We got really into the idea of a karma leaderboard and giving props to people in the office after about a month of use — after that it was a key part of office culture. We also soon learned that baking cakes is a sure fire way to boost your PlusPlus score. Is that cheating? Possibly but the net is that there is cake. To add the PlusPlus bot visit www.plusplus.chat or just click the button. Yes that one just below. As always this is in beta. It’s got a few bugs. We are putting it out there for you to play with. If you have any feedback please let us know by leaving a comment below.